Allegheny North Veterinary Hospital - Welcome! ​Pets are part of the family. Trust us to give your best friends the compassionate care they deserve. Allegheny North Veterinary Hospital provides complete medical, surgical, and dental care to dogs and cats in the Greater Pittsburgh area. 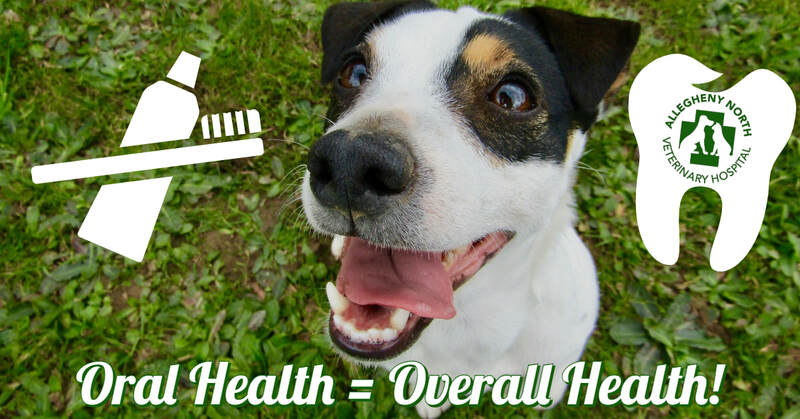 Our experienced team of veterinarians and certified technicians make your pet's health and well being a priority, and we work hard to provide the best possible pet care at an affordable price. We believe that "prevention is the best medicine" - this is achieved through wellness examinations, nutritional management, vaccines, routine blood tests, and dental care. By preventing disease and detecting it early, we can work with you to help you spend more years with your dog or cat. Allegheny North Veterinary Hospital has been accredited by the American Animal Hospital Association (AAHA) since 2006. This prestigious award goes to veterinary practices that meet stringent criteria regarding patient care, equipment maintenance, record keeping, emergency protocols, and more. Every 3 years, we undergo a thorough examination to maintain our accreditation. Browse our website to meet our veterinarians and staff, learn about our ﻿services﻿, and enjoy helpful pet information resources that will help you keep your dogs and cats happy and healthy. We are here to help you! If you have questions or would like to schedule an appointment, call us at 412-364-5511 or request an appointment online now. Allegheny North Veterinary Hospital is conveniently located in Perrysville, just north of Pittsburgh. For directions to our clinic, visit our Contact page. Thank you for visiting, and we're looking forward to visiting with you! We're offering special discounts (plus freebies!) for all dogs and cats scheduled for a dental prophylaxis in February & March. Ask about our Senior Wellness Program! ​We believe in building a foundation for health through prevention and early detection of disease. To provide the best veterinary care for your pets, we have developed a comprehensive, affordable Senior Wellness Program that help our veterinarians diagnose conditions sooner to improve the efficacy of treatment, prolong quality of life, and reduce the long-term cost of care. Get the most out of your pet's appointment by filling out our online Senior Wellness Questionnaire! Monday-Thurs 9 a.m. - 7 p.m. Your appointment time is reserved with the doctor; failure to keep this appointment limits our ability to care for other pets in need. We do not charge a cancellation fee with reasonable notice. However, if you fail to keep a reserved appointment time and do not call in advance, you will be charged a $25 No-Show Fee.